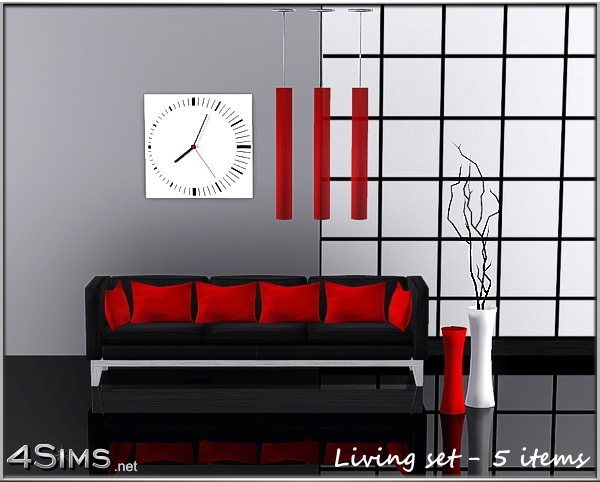 Modern living room set minimalistic style, 5 items included: large 3 seats sofa with pillows (confort +++, environment 4), big designer wall clock (environment 10), triple tube ceiling lights (fully functional plus environment 2), double vase (environment 8) and Japanese divider style pattern. All of them new custom meshes, 3 color styles included for sofa, vase and light, base game compatible. Oh my gosh! This looks so authentic!! Love it. Thank you. Beautiful, gorgeous living set…. brilliant job; stunning. Thank you so much. were do you find the Japanese pattern in wallpapers? Is included in this set….